Your seating plan is your guests’ road map to your wedding breakfast, so it’s essential. Here are a few creative wedding table plan ideas to make yours stand out. Once you’ve crafted your dream guest list and sorted out who will sit where, you can get to the fun part - working on your wedding seating plan display! 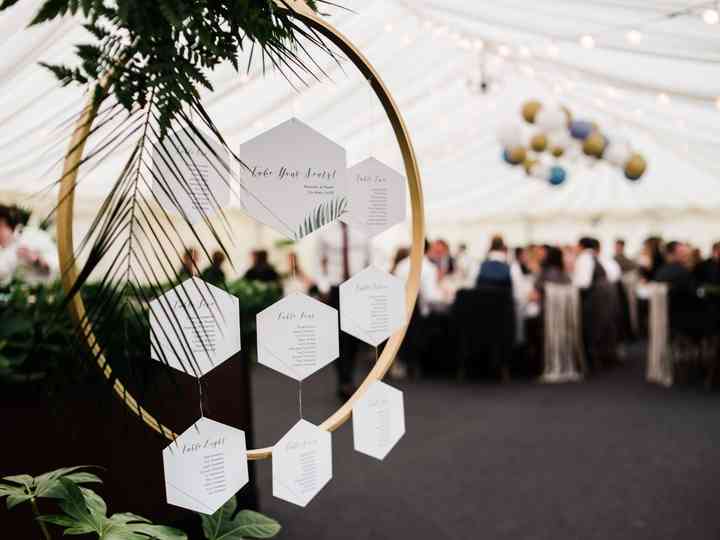 There are plenty of creative wedding table plan ideas, so skip doing something plain and simple and go for something bold and on-theme, instead. We’ve rounded up a few of our favourite wedding table plan ideas to help you figure out what the perfect style is for your big day. Here are a few creative wedding table plan ideas. If you’re going for a bold boho theme or something a bit more whimsical, why not infuse your wedding seating plan display with some colour? Instead of white sheets, mirrors or chalkboards, use rainbow coloured paper as your base. This is a tried and true option that never fails. Find a frame that suits your wedding theme - this gilded style is perfect for vintage or elegant celebrations - and deck it out with flowers that match the other arrangements you’re displaying around your reception venue. This wedding table plan idea using a geometric base is a touch more modern. Wooden easels and hoops are perfect for rustic and boho looks, but if you want something a bit more streamlined, we suggest opting for something sleek, minimalistic and metallic. These wooden place card holders are the perfect way to show your guests who will be sitting where at woodland weddings, rustic countryside affairs and garden parties. If you want to save a bit of money, you can hunt down the logs yourself and turn this into a DIY project. If you want a wedding table plan idea with a bit of vintage flavour, try to hunt down some decorative mirrors at your local antique market or thrift shop. You can use multiple small mirrors or one giant framed mirror - both options look awesome, so you really can’t go wrong. Clothespins are a sweet and simple way to give your rustic or vintage seating plan display a bit of personality. You can go classic wooden pins for a shabby-chic vibe or decorate them with paint, wallpaper or baubles to fancy them up a little. Chalkboards are one of the most popular wedding table plan ideas. Why? You can make them work with just about any wedding theme and they’re easy to edit if you need to make any last minute changes to your chart. If you want to make your seating plan display fashion-forward, use a magazine rack to show it off. You can fill it with your own custom faux magazine covers or plaster your guests names to a few of your favourite publications. Give your wedding table plan a bit of old Hollywood flavour by adding a few art deco designs to your chart. Don’t forget to choose a retro font that looks like it belongs in big lights! If you’ve got a green thumb or just want to infuse your reception space with a bit more flower power, display your wedding seating chart on vessels filled with your favourite blooms. Terracotta pots and silver pails (like these) work best for rustic affairs, but you can totally make yours more elegant with crystal vases or metallic jars. Hessian, craft paper, a couple clothespins and some twine can really go a long way! If you’re into DIY-ing your wedding table plan, this is a great option - any imperfections will make it look even more awesome. Can’t get enough of true crime podcasts? Is a murder mystery party right up your alley? Well, why not show off your seating plan like the board game Clue. It’s a truly unique way to show your guests where to sit and is a bit more fun than your typical framed chart. Worried your guests won’t know a thing about their tablemates? Give them a little background info on your seating plan display. Write little bios so that everyone is familiar with who they’re seated next to. This is the perfect style for couples with wanderlust. Don’t forget to give your tables travel-inspired names to tie everything together! Show your guests exactly who they’ll be sitting with by using polaroids to show off their pretty faces on your seating chart. Be sure you choose flattering shots of all your guests, nobody wants their worst angle on display! Photo editing by Monica Lorraine.